Please note that the following article, published in The Computing Teacher, Vol. 22, No. 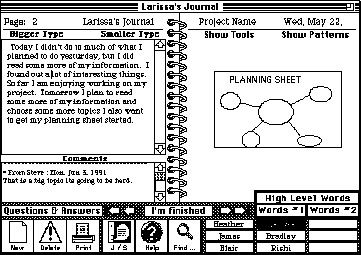 7 led to the development of a software environment called Journal Zone. A more recent paper, with updated technologies, is MULTIMEDIA – Blogs, Digital Storytelling, Flash, Podcasting: Enhancing the Knowledge Building. ‘Visual essays’ or ‘multimedia reports’ created with HyperMedia tools are relatively common in many school systems as a means by which students can report their project findings on a subject topic (e.g., ‘endangered species’). Multimedia reports typically include graphics, text, sound, animation, and video. But I question how much effect this has on the students’ understanding of the content or thinking processes involved. However, I believe that there are methods which encourage students to ‘transform’ knowledge into new forms rather than to simply ‘tell’ about something they read. Many of the ‘multimedia reports’ created by students are attractive and interesting, but what knowledge have the students developed in their creation? Have they merely made a linear stack with reworded information that they acquired from books? Or have they reworked the knowledge to create new understandings for themselves? What kind of knowledge have they developed? Did they acquire new subject knowledge? What about procedural or metacognitive knowledge that is not domain specific, but rather will add to their expertise as a learner? Journal writing, collaboration and procedural facilitation embedded in a classroom culture focussed on ‘mindfulness’ or ‘intentionality’ may be used to support these kinds of learning. When I speak of mindfulness or intentionality I speak of a student’s wilful attention to, and skill in, learning. Students demonstrate an ‘engagement’ in the task. There is a desire to be involved and great effort is expended in such engagement. Intentional Learning is a construct I find useful in thinking about these issues. Bereiter & Scardamalia (ref 1) briefly describe Intentional Learning “as the voluntary direction of mental effort.” Students set goals – both task and cognitive goals. They choose to, and are able to, apply any unused mental effort to increase their proficiency on the task or to generalize that which is being learned to other domains. They consider, not only the task at hand, but also the larger spectrum in which such learning is embedded. Students consider the knowledge explicitly and separate from the present task. They are learning to: relate old knowledge to new (new to future etc); generate alternate solution strategies before selecting and embarking on one course of action; identify unknowns in the task at hand; recognize similarities among problems and relate this to the task at hand; identify what was learned while engaged in a task and relate it to other tasks (across time and space); plan steps both in advance and in reflection; ask more about procedures rather than outcomes and products (as novices do). They negotiate meaning with their peers. They ask questions. They seek answers and construct solutions. Intentional learners are learning to become expert at becoming expert. They are learning not only declarative subject matter and procedural functionality, they are acquiring valuable metacognitive knowledge as well. Journal writing allows for the externalization of knowledge through language. Language plays an important role in making knowledge explicit by objectifying experience. Brown, Collins and Duguid (ref 3) suggest that school generally disregards the inventive heuristics that students bring to the classroom. Journal writing allows for expression and social sharing of these. Journal writing allows students to state their ‘understanding’ of a topic or problem replete with all the associate ‘bugs’. These buggy statements are then explicit and can act as a medium for mediating new understanding in collaboration with others. Central to knowledge construction is a recognition that learning is a social process. Vygotsky claimed that all higher level cognitive processes arise out of social experience. These social interactions allow for the concepts, vocabulary and processes necessary for task functioning to be made explicit. Through repeated interactions of this sort, the student comes to recognize and internalize these processes and once internalized then the individual has moved to a higher level of conceptual ability. Stated somewhat differently, Perkins and Salomon (ref 4) maintain that “learning takes place in a social context (e.g., reciprocal teaching), whereby justifications, principles, and explanations are socially fostered, generated, and contrasted.” Collaboration encourages one to consider and resolve cognitive issues in order to participate effectively. One must make sense out of one’s existing knowledge and information, struggle with disparities, resolve difficulties and then state it to another. The externalization of procedural knowledge may be considered in the same way. Before communicating one’s plans and strategies, one needs to explicitly wrestle with the generation of a number of strategies and select one to pursue. One then needs to attend to the monitoring of one’s progress on the task. Finally, one may be required to express reflections on the task or suggest application of learned knowledge to other domains. Other students supported his position through their comments. The following example illustrates students planning to link their stacks. Collaboration may also provide substantive knowledge. Substantive knowledge differs from procedural knowledge in that it is declarative. Children are better at detecting errors in work other than their own. They are, therefore, in a strong position to contribute meaningfully to the knowledge of others. Collaboration may lead to insights that might not occur without the benefits of the discussions and interactions. It can be said that groups are not just a suitable way to collect the individual knowledge of their members but that they cultivate insights and solutions that would not otherwise occur. Collaboration, therefore, may lead to a ‘whole’ that is greater than the sum of its parts. Methods to enhance collaboration include: establishment of a common, or shared, task because cognitive processes that are normally hidden are made overt through the pursuit of a socially shared intellectual task and are a focus for discussion and clarification; a classroom focus on creating knowledge building communities where groups ‘work together to advance the knowledge of human-kind’ (ref 5); establishment of a task that engages students in acquiring, developing, and using cognitive tools in authentic domain activity; provision of a collaborative journal writing environment such as ThinkingLand (which is discussed shortly). Procedural facilitations encourage the change of normally covert procedures into overt procedures. They help students to consider one’s own higher level strategies and they promote the active decontextualization of knowledge. They may allow the user to decenter from personal thoughts and think about other considerations. They facilitate an internal dialogue when no other partner exists to ‘bounce ideas off’. Procedural facilitations can take many forms, but prompts, questions or sentence starters are common (see Figure 3). ThinkingLand is a computer based, collaborative journal writing environment which has been used with students as they create multimedia reports. It is a classroom tool that integrates these three common practices of exemplary teaching. Journal writing, collaboration and procedural facilitations (in the form of prompts) encourage students to think more deeply, not only about the task at hand, but also about their own thinking and learning processes. As shown, when students sign on to ThinkingLand they have access to both their own journals and to the journals of others. A student may go to their own journal immediately to make an entry or they may browse through the journals of others adding comments in response to various entries. At this point, one may reflect on a variety of issues related to the task. Some of these may be salient to the student in which case journal writing may be spontaneous and free flowing. In other instances, the student may need support in thinking what to think and write about. Procedural facilitations, in the form of prompts, are available to assist the student. These are provided as sentence starters and are divided into two basic categories – plans and reflections. Samples are shown in Figure 3. ThinkingLand is a relatively simple tool in its design. What one does with this tool, however, may lead to sophisticated results. Cognitive tools or technologies of the mind are only powerful with mindful engagement. “No computer technology in and of itself can be made to affect thinking. One needs to consider, both theoretically and practically, the whole social and cultural milieu in which instruction takes place” (ref 6). 1. Scardamalia, M. & Bereiter, C. Child as co-investigator: Helping children gain insight into their own mental processes. In S. Paris, G. Olson, & H. Stevenson (Eds. ), Learning and motivation in the classroom (Hillsdale, NJ: Lawrence Erlbaum Associates, 1983) pp. 61-82. 2. Cappo, M. & Osterman, G. Teach students to communicate mathematically. 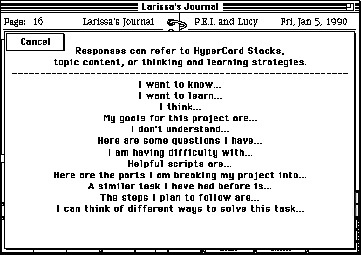 (The Computing Teacher, Feb. 1991) p.35. 3. Brown, J.S., Collins, A., & Duguid, P. Situated cognition and the culture of learning. (Educational Researcher, Jan/Feb. 1989) p40. 6. Salomon, G., Perkins, D. & Globerson, T. Partners in cognition: Extending human intelligence with intelligent technologies. 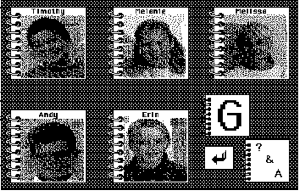 (Educational Researcher, April 1991) p. 3. These are great ideas and even better examples. I especially like the constructive banter that eventually leads to more in-dept learning.